Psst… We’re going to let you in on a secret. A new, inspirational 3km race is planned for cities across Canada, and its roots are right here in the Beach. The inaugural Secret Marathon launches Wednesday, March 7 at 6:30 p.m. at the Beaches Running Room on Queen Street East, as well as nine other Running Rooms in cities across Canada. The run/walk event is a 1.5 km out and back race, and the route is kept secret until the beginning of the race. The national event is inspired by the experiences of runners in the Marathon of Afghanistan, that country’s first official marathon, where the route needs to be kept secret as a matter of safety. After local filmmaker Kate McKenzie and her colleague Martin Parnell filmed a documentary about the race, titled The Secret Marathon, set to be released in the fall, the pair were inspired to create an event to honour and share those women’s stories and celebrate everyone’s right to run. “In Afghanistan we witnessed something really special,” said McKenzie. 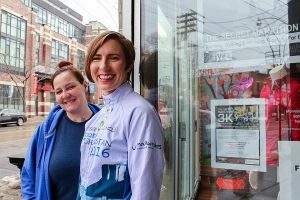 Filmmaker Kate McKenzie and Beaches Running Room assistant manager Terri Lancelotte prepare for the inaugural Secret Marathon 3K on March 7. “Women and men came together in solidarity under extremely difficult circumstances, to support the right that all humans should have to walk or run free of fear in their community,” she added. By the time McKenzie met John Stanton, the founder of Running Room, last spring and told him about the film and her experiences in Afghanistan, she was already a member of the Beaches Running Room community, having signed up for their weekly running group when she first arrived in Toronto. While McKenzie would have been happy to launch the race in only one city to start, Stanton and the team at the Running Room encouraged her to think bigger. “The Secret Marathon builds a sense of community during a time in which our world needs more community,” said Stanton. Now, also aided by the charity Canadian Women for Women in Afghanistan​, the race is taking place the day before International Women’s Day in 10 cities across Canada – including McKenzie’s hometown of Calgary, giving the Beach an unofficial rival. McKenzie thinks Calgary has more signups right now, but after an enthusiastic meeting at last Wednesday’s regular Beach running group, which Running Room assistant manager Terri Lancelotte helped organize, she thinks that won’t be the case for long. To register for The Secret Marathon 3K go to https://www.events.runningroom.com/site/?raceId=14758 and for more information about the event and the film, visit www.thesecretmarathon.com. The race starts at 6:30 p.m. on March 7 at the Beaches Running Room, 1977 Queen St. E., with post-event celebrations planned until 8:30 p.m.